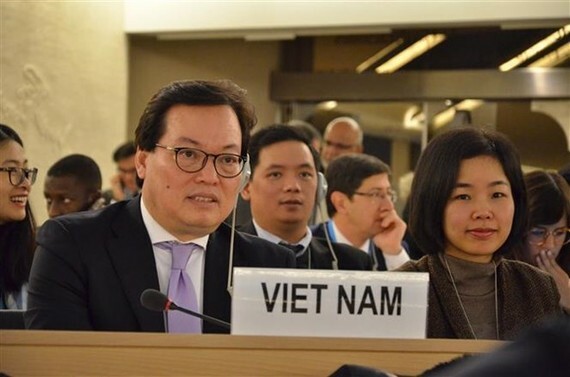 Vietnamese Ambassador Duong Chi Dung, head of the Vietnamese permanent mission to the United Nations, the WTO and other international organisations in Geneva attended the 37th session of the UN Human Rights Council which opened in Geneva on February 26. The first week of the event will feature a high-level meeting, to be attended by President of the UN General Assembly Miroslav Lajcak, UN Secretary-General Antonio Guterres, UN High Commissioner for Human Rights Zeid Ra’ad al Hussein and nearly 100 leaders of countries and international organisations. Opening the event, UN Secretary-General Guterres and leaders of member countries welcomed achievements that mankind has made since the Universal Declaration of Human Rights was issued 70 years ago. They stressed that the international community should make more efforts to tackle challenges facing human rights, while strengthening cooperation in implementing global commitments, especially the Agenda 2030 on sustainable development. Guterres and other UN officials expressed concern about the expansion of terrorism, extremism, xenophobia, discrimination and migration. The human rights situation in Syria and Rakhine State of Myanmar also drew attention. Vietnam will deliver presentations and join discussion on a number of issues during the four-week session, and contribute to the negotiation process to build documents of the UN Human Rights Council. On the sidelines of the session, Vietnam will host an international seminar on the role of information and communication technology in promoting economic, cultural and social rights and reducing inequality on February 27. The event is also co-sponsored by Maldives, Bangladesh, India, Japan, France, the Philippines and the International Telecommunication Union. The session, which will run until March 23, also includes thematic discussions, dialogues and talks on human rights in Burundi, the Democratic People’s Republic of Korea, Ukraine, DR Congo and the Central Africa Republic.